After breakfast disembark from the house boat and proceed to Kovalam by road. 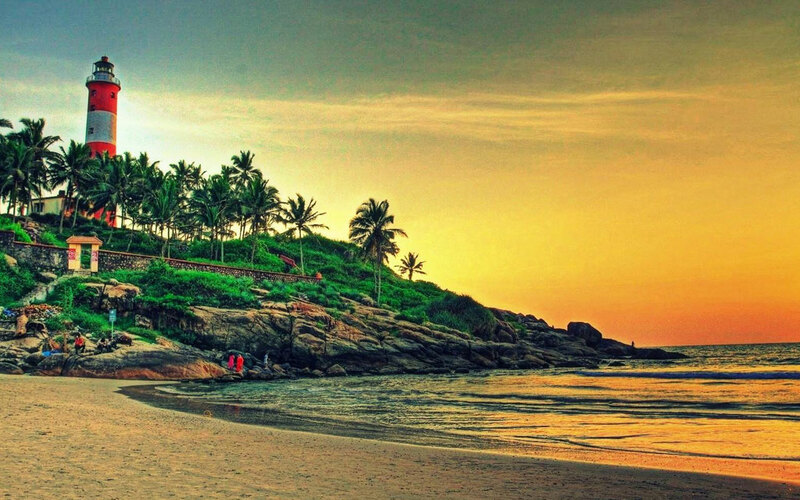 On arrival check in to the hotel after freshen up explore the serene beaches of Kovalam and enjoy walk, sunbathing and see the breathtaking view of sunset later return to hotel and stay overnight. On this day after breakfast in the morning, relax on the beautiful beach of Kovalam later excursion to the southernmost tip of Cadamom Hill Kanyakumari also known as Cape Comorin during the British days. Surrounded by three seas, this island is best place to view the picturesque sunrise and sun set. On the way to Kanyakumari visit Padmanabhapuram Palace a beautiful architecture gem built during the 16th century famous for its opulent sculpted décor and rosewood carvings. On arrival at Kanyakumari visit Vivekanand Rock Memorial. Later drive back to Kovalam and stay overnight in hotel. This day after breakfast you are free to relax and enjoy your time at your leisure, to make a good use of time available before departure enjoy morning sightseeing of Trivandrum capital city of Kerala. Later drive to the airport to board flight for your onward journey back home.